Red Bull Air Race Tickets - worth it? 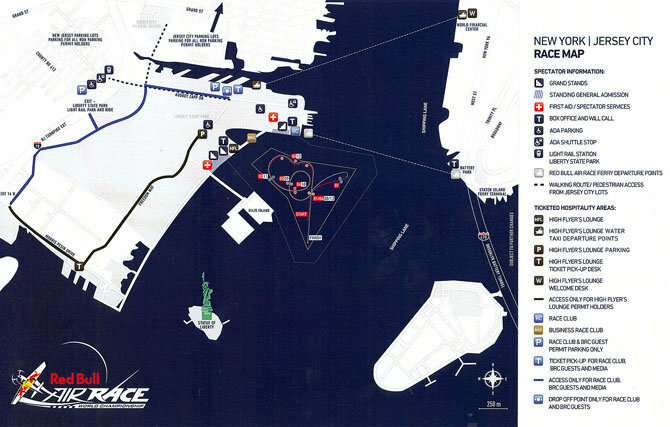 Is it worth getting tickets for the Red Bull Air Race - New York? How's the view from the ground? I enjoy watching it on TV and YouTube, am I going to be disappointed by watching it from the ground? This previous AskME suggests that tickets aren't worth it. Bonus: Any ideas where I could watch it for free from another nearby location? Map of the course. It seems like they smartly picked a location where it is almost impossible to see from outside of Liberty State Park, which requires a ticket. Ellis Island looks like it would have great views and would be $12 for the ferry, but the real tickets are only $30 for standing room and would probably be a bit better. This is more of a bay than a river like they usually use. I'm sure it's visible from Lower Manhattan and Governor's Island, but not close enough to really enjoy. I have never been to this particular air race. However, in my opinion, the pleasure of attending an aviation event is not solely in great views. It also involves the whole vibe of the event, seeing various interesting a/c on the ground, checking out the vendors, enjoying the flybys, and spending a day in the sun with other air-minded people. It's kind of like a concert: you don't see the band up close and the sound quality is inferior to recordings but it's still worthwhile. However, in my opinion, the pleasure of attending an aviation event is not solely in great views. It also involves the whole vibe of the event, seeing various interesting a/c on the ground, checking out the vendors, enjoying the flybys, and spending a day in the sun with other air-minded people. Based on what I've seen from the people who attend the races in my area, this is basically true. It's a big garden party and you go get drunk. That's about it. None of the photos that people have posted on Facebook of them attending the races show planes, just people with one arm around a friend's shoulder and a drink in the other hand. Is the Staten Island Ferry running in the area or is the water below the event closed to traffic? Thanks everyone, I'm gonna skip it and just catch the better bits on TV.